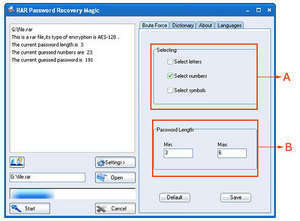 RAR Password Cracker is a password recovery program for RAR files. It will help you crack open the the archive which has a password set. It is a rather simple program with the simple purpose of finding a way in to a file which has been protected with a password. The program supports two methods of attack: a dictionary attack *or* a Bruteforce attack. RAR Password Cracker 4.12 is a shareware program and can be used as a demo to try the software until the free trial period has ended. A full version of the program is available after the trial period ends. For security reasons, you should also check out the RAR Password Cracker download at LO4D.com which includes virus and malware tests. Additional screenshots of this application download may be available, too.